Who would ever have imagined that a book about catastrophes could be informative, entertaining, and helpful? In this magnificent volume, Eva Horn has achieved this trifecta. As a bonus, the book is erudite and paints a picture of thinking about disaster as a strident criticism of modernity’s blind faith in human progress. Read it! ‚Why do we imagine ourselves as Last Men​?‘ Eva Horn’s imaginative, incisive, and wide-ranging exploration of this arresting question doubles up an arresting genealogy of the modern fear of the future as catastrophe. An illuminating read, not only for students of modernity but also those pondering the looming crisis of climate change. Tacking between the fictional and the real, Horn provides the most comprehensive analysis to date of why we are such avid consumers of dystopian disasters and what these not-so-artificial scenarios mean for our ability to contend with these portentous events. 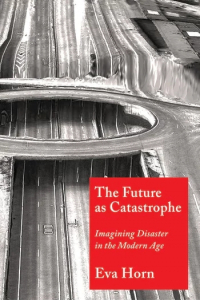 The Future as Catastrophe examines the content, sources, history, and function that the catastrophic has for politics, knowledge, and the human capacity to imagine its own destruction. With the notion of the ‚Anthropocene,‘ we have learned to think, in an entirely secular and scientific way, the end times of human life on the planet. With breathtaking erudition and in stunning and precise prose, Eva Horn guides us through the ways in which the natural and social sciences, economic and political theory, and above all literature and popular culture, have, over the last two centuries, sought to rehearse scenarios of the end and its aftermath. As Horn also shows, the future perfect tense of catastrophe—all this will have been—serves as a remarkable diagnostic lens for the revelation—the ‚apocalypse’—of the present tense of catastrophic ways of living.